A new study shows California’s housing rules are exacerbating the housing shortage as the crisis grows. A new brief grading regions on state-mandated housing goals finds chronic lack of participation and failure on low-income housing targets. SAN FRANCISCO — At the current pace of development, certain jurisdictions in California will not meet their low-income housing production targets for more than 1,000 years, according to a new brief from nonprofit think tank Next 10 and Beacon Economics. While Santa Clarita is on track to meet its target for above-moderate-income housing in 2025, the city won’t hit its goals for low-income housing until 2060, moderate-income housing until 2571, and very-low-income housing until 2812, according to the study. 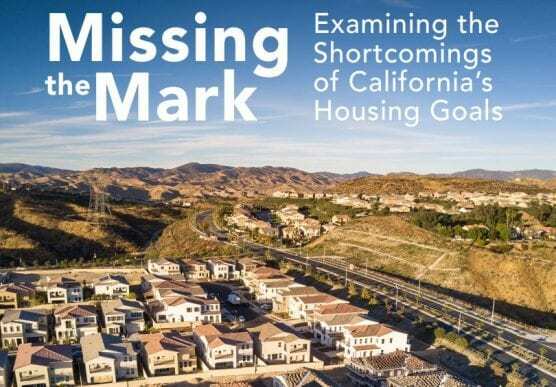 The brief, Missing the Mark: Examining the Shortcomings of California’s Housing Goals, grades the state’s 539 jurisdictions on progress toward meeting their current Regional Housing Needs Assessment goals. RHNA targets, updated every five to eight years, determine the number of housing units at each income level that every California jurisdiction needs to permit each cycle. “This data shows that state-wide, less than 10 percent of the RHNA-allocated low- and very-low income units have been permitted, compared to nearly half of the higher-income housing,” said F. Noel Perry, businessman and founder of Next 10. “This disturbing trend reveals how little is being done to alleviate the affordability crisis in California, contributing to rising homelessness and displacement across the state,” Perry said. The brief finds most jurisdictions are far behind on meeting their RHNA goals. • The analysis finds a chronic lack of participation in the assessment process — with 100 of the state’s 539 jurisdictions having not filed an annual progress report since tracking began. o The lack of reporting may be due to local capacity constraints, as the majority of jurisdictions that have never submitted an APR are lower-income areas of southeast Los Angeles County and the Central Valley. • Only 25.9 percent of the allocated units state-wide have been permitted across all income levels, even though the current RHNA cycle is more than half over. • The percentage completed is progressively worse the lower the income level for housing units. 19 percent of moderate, 9.8 percent of low income, and 7.3 percent of very low-income units have been permitted. for the very low-income category. • At the current pace of very-low income housing permitting, San Francisco and Oakland will meet their very low-income goal around 2030, Los Angeles and Long Beach won’t meet their goals until closer to 2040, Palo Alto won’t hit theirs until 2063, while Santa Clara won’t hit their target until beyond 2500. • At the above moderate-income level, San Francisco, Oakland, and San Jose will meet their goals by the end of 2019, while Riverside won’t meet their goal until after 2200, based on current permitting pace. • Some jurisdictions are over-building higher-income housing, while not building lower-income housing. • For the 100 jurisdictions not reporting, the brief uses building permit data to verify that together they have permitted no more than 21.6 percent their assigned RHNA housing units for all income levels. To better capture progress toward meeting true local housing needs, this brief grades all jurisdictions on their progress meeting RHNA goals. The analysis finds certain areas of the state earning high grades — as they are on-track to meet their RHNA goals for some, if not all, income levels. However, some of these regions have high grades because they have very low targets for housing units relative to local population. When the bar of success is so low, the RHNA targets themselves must be re-evaluated. “If Beverly Hills can get an A because they built all three of the units allocated to them over an eight-year period, despite being forecasted to add an estimated 300 households and 3,400 jobs by 2020, you begin to get a sense that the targets themselves are part of the problem,” Fowler said. • For some jurisdictions, particularly higher-income areas, the allocation of RHNA targets is misaligned with population change and job growth projections. only 0.7 units assigned per 100 persons. received a B+. However, they have the lowest total RHNA allocation as a percentage of 2017 population (0.9 percent and 1.1 percent, respectively) compared to the ABAG-wide average of 2.4 percent. San Francisco County has the highest total RHNA assigned relative to population (3.3 percent) within ABAG. Currently, the Department of Housing and Community Development determines how much new housing is needed in all regions of the state based on population forecasts from the Department of Finance, then HCD works with local councils of government to finalize numbers as part of the local government’s general plan housing element. • Local zoning rules that favor single-family units over multi-family units be revised, to ensure communities can adequately meet their housing needs.